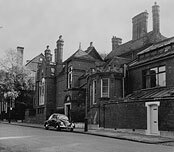 Little Holland House was built in 1876 for the sculptor George Frederick Watts. It was to be his home until his death in 1904. The architect was Frederick Cockerell. Thobey Prinsep had leased a large plot from the Earl of Ilchester and gave part of it to Watts. Three studios dominated the ground floor, two of them rising through to the first floor. The huge windows show the location of one of the studios. These were required as Watts sculpted very large statues, including Physical Energy in Hyde Park. There was very little living accommodation. Watts did not want to be distracted from his work by visitors and therefore tried to discourage them. The house next door at number 8 belonged to the artist Marcus Stone. On the other side was the Thornycroft family's home both of which still stand.